We have been enjoying our new patio table and chairs this summer, which provide much-needed space and are extra comfortable as well. Here's the story of our dining patio. My search began in early spring. Since I couldn't really get out to shop very easily with the babies, I was limited to online resources. I wanted the table and chairs to match the style of our house but wasn't able to find a set that was old-fashioned and had character. So I decided to mix and match. For the table, I ended up ordering a maple base kit that Mike assembled (the company recommended maple for outdoor use). The table seats six. All that remained was to add some simple cedar planks (cedar is most weather resistant) to complete the surface of the table. We stained the table with a platinum gray solid-body exterior stain from Benjamin Moore. Although the paint itself is different, we used the same platinum gray color on our wraparound porch floor. 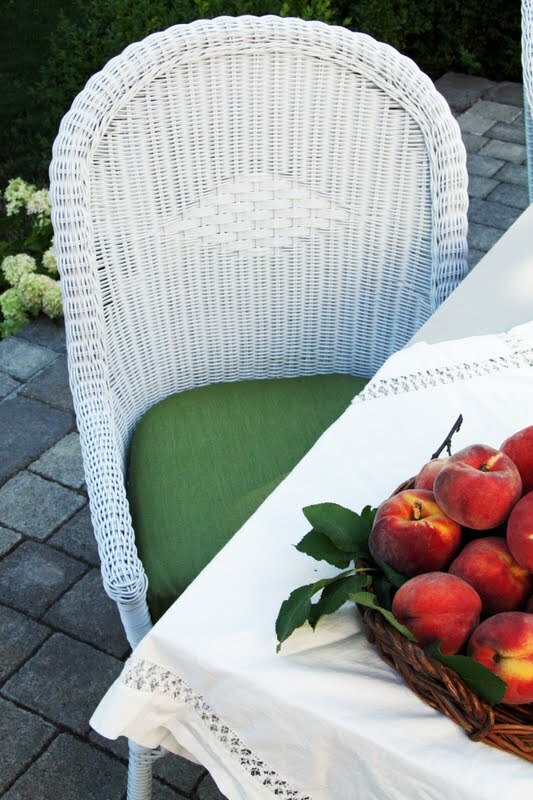 It was a challenge to find white outdoor wicker chairs (in our price range). I looked online until my eyes were crossed and then my lovely friend Joan (For the Love of a House) suggested these chairs from Pier 1 Imports. They were exactly what I was looking for - not too bulky, nice lines, weather resistant, and affordable. I bought six. For the cushions (another lengthy search), I found these at Home Decorators Club. I chose the color cilantro. We also added some new plantings to the patio. To complement the Limelight hydrangea, we replaced the lavender plants that were next to the stairs with these Little Lime hydrangea. It is a new variety of Limelight that I found at the nursery last spring. They offer a nice, compact version of the larger Limelight variety. The regular Limelight blossoms can get as large as footballs. These larger blossoms are in the sunniest area of the patio. In addition to the last of the blueberries, we have these to enjoy. I picked up 20 pounds of organic peaches last week, the latest summer treat in the County. 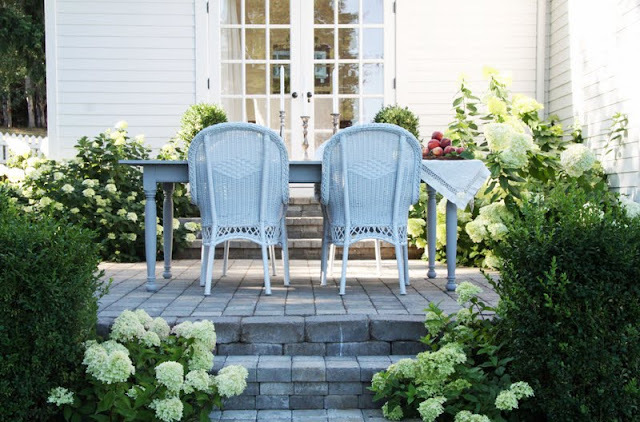 How very talented and thrifty you are...your table and chaIrs as well as your plantings show your love, care and artistic eye...what a pleasure it is to share your life thru your blog.. I have been looking ALL Summer for a table just like this one~~~ it looks wonderful!!! My wife and I love the look of an old farm table, and this is perfect!! I have been following your blog and all of the work you and your husband have done to your beautiful house. I love your blog. Thank you for sharing your home and life with us. It makes for a gorgeous patio setting. I'd be so afraid of weather damage to the table however. Does it have a special weather proof type paint/finish on it?? What a great idea for the table. I might have to steal that. i didn't think it would be possible to improve on what you had...but you did. it is gorgeous and i LOVE those chairs. joan has the best resource list! love the colors you chose too. This is such a beautiful, peaceful space. PERFECT. I can imagine it will also be lovely in autumn. Wow! I love your whole patio - it's absolutely stunning! Congratulations! Looks lovely. A perfect match, the table and chairs together with your house. I love your hydrangeas too! A lovely post. I can already see the outdoor dinners you will have. Love it. Looks great. The candle sticks are beautiful. Just beautiful Trina, all of it! Joan is so talented...the chairs couldn't be more perfect, and I love the cushion color. And the mini Limelights are so sweet...it looks like your patio is floating in a cloud of heavenly hydrangeas...so pretty. Many special memories will be created there...I'm sure some already have. That table is just perfection! 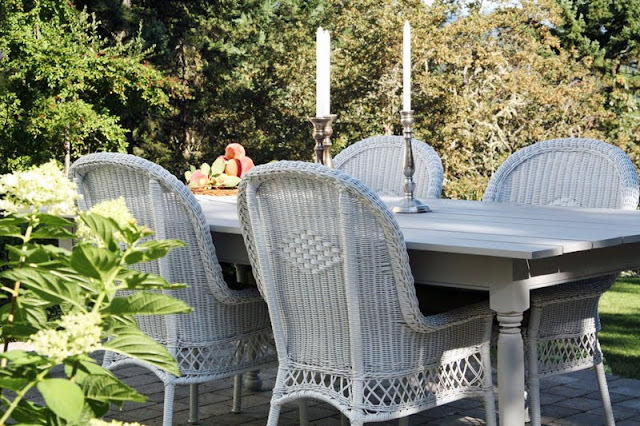 Absolutely beautiful-I love wicker and with the table it looks so perfect. Of course your plantings etc finish the look-what an incredible scene. Enjoy. I love it!! I never would have imagined that you found the chairs at Pier 1!! Very sweet! The flowers are gorgeous and I love the picture of your peaches! Oh no!~ Another blog that I love! God help me. What a beautiful place! So inviting! ohhh Trina! I adore the table (applause for Mike!) and love the color you chose! Those chairs are PERFECT there!! They look like you found them at an antiques shop instead of P1;) Such a gorgeously stunning setting! It makes me so happy to see Lucy in the background of one of the photos... sweet girl. I feel more relaxed just by LOOKING at your photos- I cant imagine how good it must feel to actually LIVE there! Beautiful dining area and a wonderful story to go with it. trina will you have to store this furniture during the winter or can it stay outdoors. we have nowhere to store anything so that would def be a factor for me. thanks. Congratulations. Another goal accomplished to perfection at the Country Farmhouse. I have imagined myself sitting at your new table in your perfect garden setting. But, do not worry. I am clear across the country in Virginia. Sadly, for me, there's no chance of this. It is gorgeous, as usual!!! 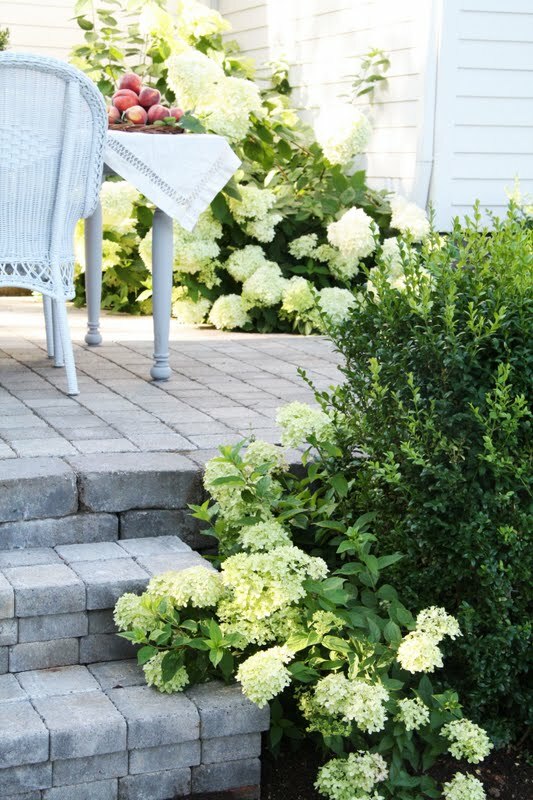 Love those hydrangeas. just like the rest of your lovely home this too is wonderful. I love the table and the color and with Joan as your trusty resource no way the two of you could miss. it's divine. Trina, I have been enjoying your blog for some time now and absolutely like all that you post. I, too, like the table and am concerned about weather (rain in my area) The chairs are lovely. Did you paint the chairs and if you did will the paint adhere to the weather resistant medium? I think I will be making a trip to my Pier I for this chair at my desk. We will bring the table and chairs indoors come fall. But we have a full basement so it's easy to bring it all in. I think with your climate, you would be fine. Perhaps the sun is the biggest concern there. The woman who I spoke to regarding the maple base said that if it's an outdoor table that we would bring in during the rainy/snowy months, that the maple would hold up just fine. Gorgeous photos. Such a beautiful outside room. Hope you have many years of enjoyment there. I am so totally in love with your house, your patio, and your style of decorating. :) It's all so very beautiful - and I find myself bookmarking many of your posts. :) Thank you for sharing it all with us! Great post. Lovely spot to enjoy some al fresco dining! So good to see mention of Lucy too. I was just wondering the other day how she's doing. A photo of her soon, I hope! I'm wondering about those peaches... 20 lb?! What do you do with them? Do you guys have time to eat them all before they go bad? What is 'inside' the patio? Did you pour concrete all over? Beautiful! So glad you share this. I would love to have a table for our porch that is a bit more non-traditional (not your typical outdoor furniture). I love the color as well. First so happy to have found your wonderful blog. Second, this is breathtaking! Oh my word, truly magazine spread worthy!!!! Love the colors and the setting is like a storybook...beautiful! Stop by to say hi if you get a minute! 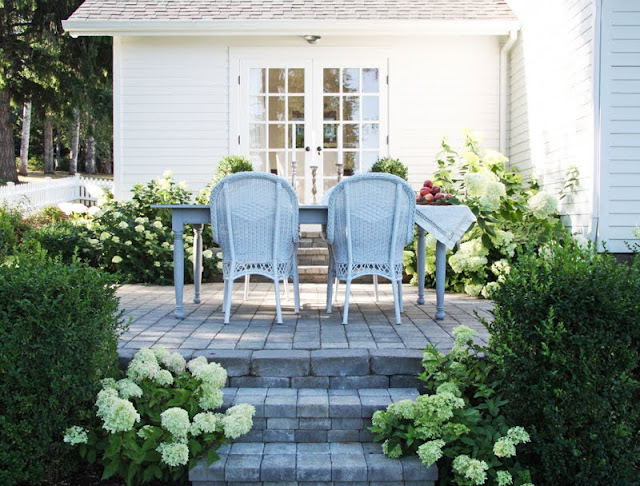 Loved the color grey you painted the furniture and the limelight hydrangeas. The patio looks amazing. Well with your head and Joan's joined together to create a project how could it be anything less than fantastic!!!? Underneath the patio is gravel, topped with sand. Due to the slope of the ground, it took some time to level things out before the pavers were put down. The peaches are in our refrigerator. We take about half dozen out at a time to warm and ripen. So far we've been slicing them over morning oatmeal, eating as is and yesterday, I pureed some up for the babies. The refrigeration really preserves them quite well. What a beautiful patio! Love the light blue chairs and the flowers are gorgeous. I don't know if you've ever considered it, but your home would be amazing on one of those home tours. I would love to be able to come see it someday....(hope that doesn't sound creepy). I just love your style. Lovely! 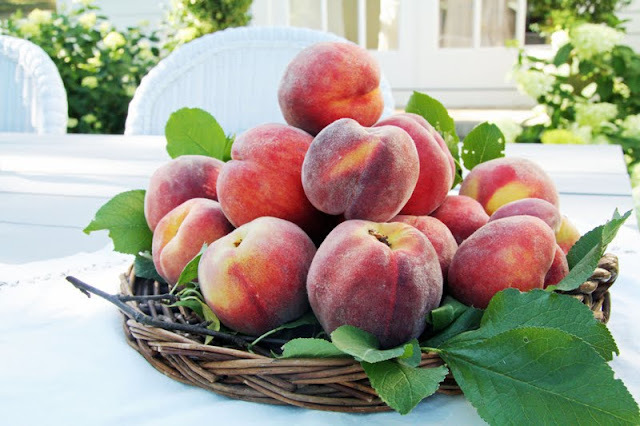 I just posted a bunch of peach recipes, if you need one: http://goo.gl/X81N4 I hope you'll check it out! I love reading your blog and learning more about your life (and watching those babies grow!). Take care. We had wicker chairs from Pier One years ago that I think lasted about 20 years. Yours are lovely and I really like the colors you chose. besos, from me, down here in Winter ! Call before you go as they pick daily this time of year! Absolutely gorgeous!!! 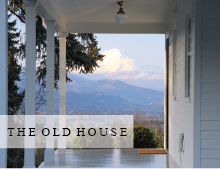 Your blog is better than reading all of my favorite home magazines combined. I am always happy and excited to see your next post. Thanks for letting us all in!!! The new dining set is perfect!!! Your new table and chairs are beautiful. What a comfy, relaxing patio! Those peaches are so big! What a treat! What a beautiful place to enjoy the summer! Trina! So pretty...and pier one is a great spot for wicker! Oh your table and chairs are just gorgeous and those hydrangeas look amazing!! Is your patio covered? I'd be careful of leaving the chairs outside unless they are resin. I had a friend who worked at Pier 1 and she had a customer that came in every year for 4 new wicker chairs because one season out in the open were are they could take and he would pitch them. Lovely, lovely. I have just stumbled onto your gorgeous blog and am so pleased to have found you. 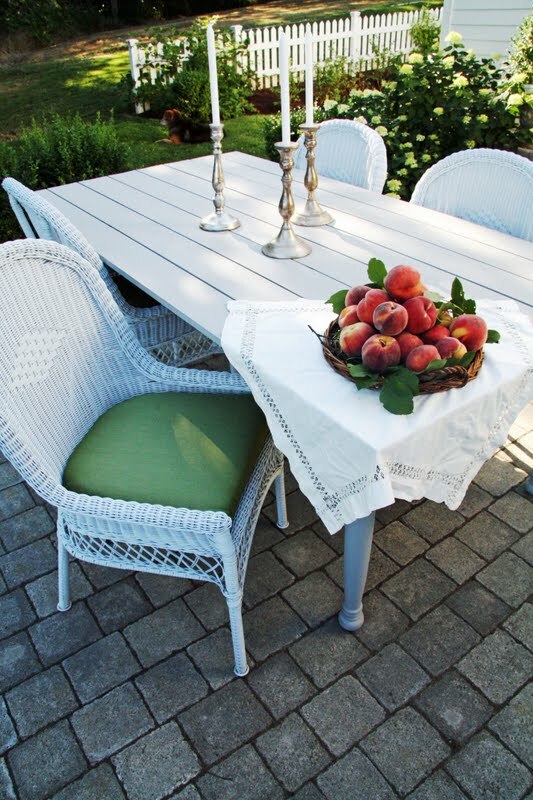 Your patio table and chairs look so beautiful and your style is very much after my own heart. So, I am now your newest follower. I love to dine outside. My wife and I ate at our backyard facing a plantation whenever as possible. I love the fresh air while enjoying my favorite steak. Heaven. Hi ... Those Little Lime hydrangea are so pretty. Would you happen to know if they would survive the winter in PA. I would love to plant some. Seriously, that patio looks like my heaven!! My absolute favorite flowers are Hydrangeas, and I love eating outside. I want to live on your patio every day! It's stunning!!! Very nice patio chairs and table. It looks divide to me because of the color. So neat, so clean and so beautiful. Glad i came across your blog! Here from Cottage and Vine...Rene is right...lovely patio! Visiting from Cottage and Vine. I'm so glad Rene featured you because now I've found your lovely blog. I'm a new follower, and now I'm off the read more of your posts. Love your patio! One day we plant to take our deck down and put a stone patio in it's place. Love the idea of a wood table with turned legs along with the wicker. 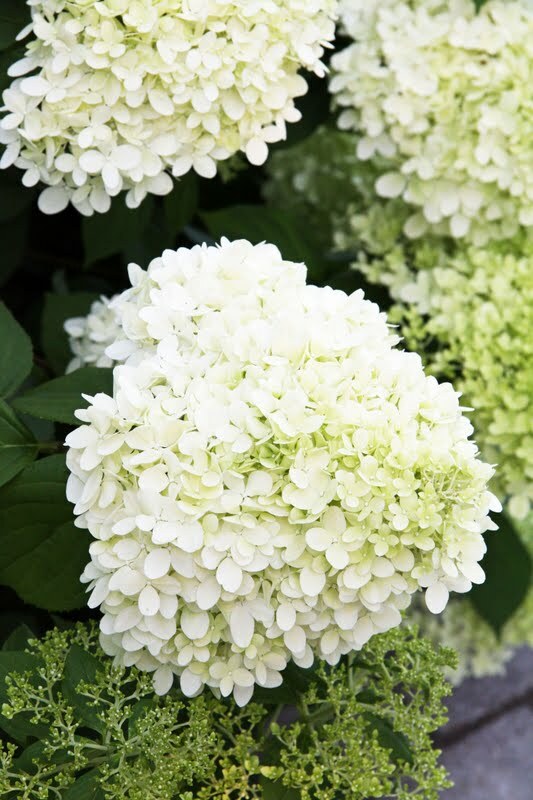 Love your hydrangea's! I have a huge limelight bush and absolutely adore it! Your place is beyond lovely! Love your outdoor space. It's gorgeous. Trina, question on the wicker chairs - I am looking for ones JUST like that for inside around our kitchen table - any resources? 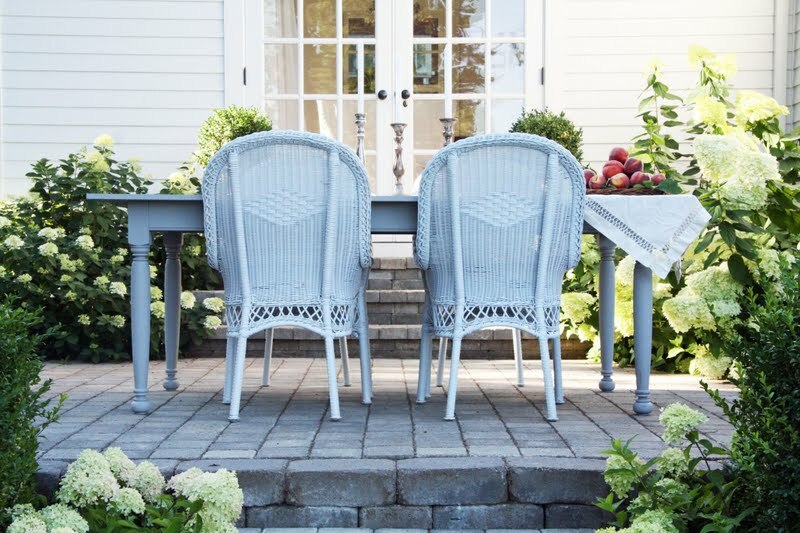 Or, do you think these would not look like bringing outdoor chairs in? I don't want them looking shiny or plasticky in a bad way indoors! Oh, your blog is outstanding! You have amazing taste, and I love the plants you choose - all my favs! blessings! I REALLY LOVE YOUR PATIO & THE REFRESHING COLORS! WHERE DO YOU LIVE? THE FLOWERS ARE SO AMAZING! I LIVE IN CENTRAL ALBERTA, CANADA, SO OUR GROWING SEASON IS VERY SHORT, BUT WE TRY & I LOVE EVERY PLANT & FLOWER I HAVE! I AM A NEW GARDENER AT 67! WHY DID I WAIT SOOO LONG? LOVE CHOOSING NEW PLANTS & WATCHING THEM GROW!! LOVE YOUR SITE! Sua mesa e cadeiras são lindas! Deixaram o espaço agradável! Muito bom fazer uma refeição ao ar livre num dia bonito! Aqui ainda está frio para isto. Estou começando um blog, dá uma espiadinha.